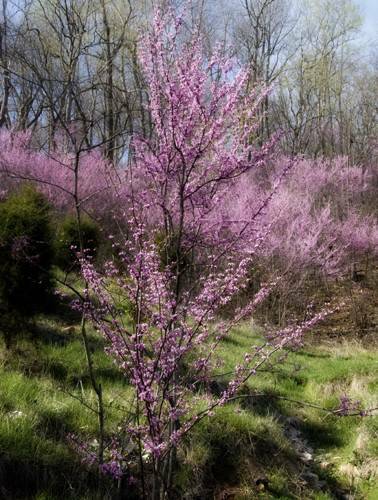 Redbuds photo by Fred First at Back of a Business Card Blurb | Fragments From Floyd. Turning the Page: What Comes Next? | Fragments From Floyd. 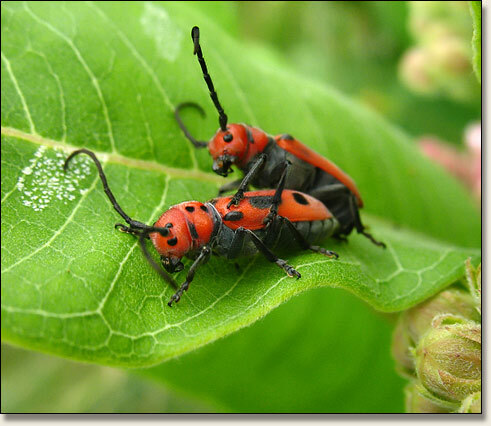 Photo of red milkweed beetles by Fred First, from the Fragments from Floyd blog. 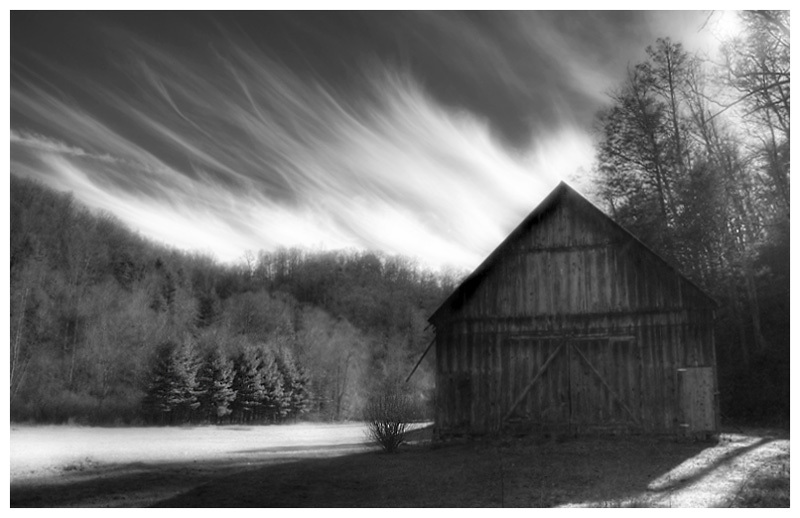 The texture and brilliance of soft clouds and the hard, sharp shadows of barn and woods spoke clearly of this day of January contrast–a pleasant thaw in a gray season yet to come. 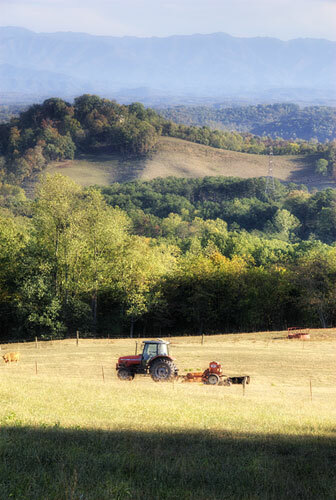 This post describes our third day visiting Floyd, Va, on Oct 6, 2007. Here’s the Day 1 and Day 2 posts. Skip took us out Franklin Pike to the east and then up 221 to the north. We saw a lot of beautiful land and a few places that we’d like to live. It was great fun just riding around, seeing new places, and sharing stories about life and experiences. We saw a number of places that would be great mountain bike tours. After several hours of touring northeast Floyd County, we returned to Cafe del Sol and had lunch. Soon after we arrived, Doug Thompson came in and we invited him to join us. From the time I spent around him, Doug seems to know everyone who lives in Floyd. We had a good lunch and said goodbye to Skip and Doug. We walked down to the Floyd Country Store. I had a $20 gift certificate to spend — from winning the Friday Night Jamboree raffle the previous evening. I knew exactly what I wanted to buy with it. It took me a while to find it, but I finally located Fred First’s book Slow Road Home. I had been waiting for the right time to get Fred’s book, and I knew this was it. The karmic circle was complete — my first awareness of Floyd came from looking at Fred’s photos (his photo to the right) on his Fragments from Floyd blog several years ago, and I get to buy Fred’s book at the Floyd Country Store. The only part missing from this story was Fred — unfortunately, I didn’t get to meet him on this trip. We hopped in our rental car and drove south to see the Jacksonville Center. There’s some interesting art being created there and I wish we had had more time and energy to explore. I was intrigued by the Sustainable Living Educational Center and the Association of Energy Conservation Professionals office on the grounds. Perhaps I’ll spend some time with them in the future. Our next stop was the Great Oaks Country Club. I have resumed my golf habit in my later years (in place of backpacking, racquetball, and white-water kayaking, for various reasons), and I wanted to see the local golf course. We pulled into the parking lot, and I walked onto the putting green and looked at the ninth and eighteenth holes. It looks like a good golf course. We were running low on energy, so we picked up some groceries and headed to our farm house to have dinner. After dinner, we decided to stay in and relax. Later in the evening, we stepped outside to look at the stars. The night was quiet and dark, and we could see thousands of stars. The Milky Way was obvious, and shooting stars flashed by every few minutes. We really miss quiet nights and starry skies — in the mid-1990s we could see stars from our back deck and the traffic noise was minimal. Since then our area has been transformed from rural to Atlanta suburb, and we no longer have quiet nights and we can’t see many stars. We fought a good fight to preserve the rural character of our area but Atlanta’s growth is an unstoppable force and real estate developers have been getting rich throwing up stores and subdivisions all around us. It doesn’t feel like home anymore. Another full day — we needed sleep. Sunday was travel day — return to Atlanta.